During the last few decades, cities in the Phoenix Metropolitan area became bustling economic centers providing jobs and homes for millions of new residents. Development spread across what had been farmland, orchards, and virgin desert. Despite enthusiastic development, city officials worked to preserve open spaces, distinctive desert trees and plants, and water supplies. It was never an easy balance and cities learned to become very practical conservationists. For example, here is a brief description of three conservation ordinances adopted by the City of Scottsdale. Environmentally Sensitive Lands Ordinance: Scottsdale first adopted the ordinance in 1991. It helps to shape the location and size of development in about two-thirds of the city. The ordinance preserves natural landmarks, native plants, archaeological sites and geological sites throughout the city. It applies to private development and development by the city. (Scottsdale has protected most of the McDowell Mountains from development by creating the 30,200-acre McDowell Mountain Sonoran Preserve.) The ordinance protects washes thick with mature desert vegetation to help maintain continuous and connected open space and habitat for wildlife. It limits the number, density and height of buildings and requires developers to set aside open space where the desert is undisturbed or restored to it natural condition. The ordinance not only encourages development that blends with the desert, it also minimizes the city’s cost of building infrastructures, such as roads and water and sewer systems, and reduces the amount of landscape that can be irrigated. 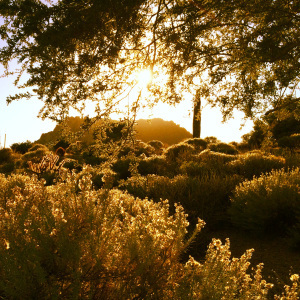 Native Plants Ordinance: Scottsdale first adopted the ordinance in 1981. It requires developers (including the city) to salvage or protect 15 types of mature and healthy desert trees, including Desert Willows and Ironwood, and five types of cactus that have reached at least 3-feet in height, including Saguaros and Desert Night-Blooming Cereus. This ordinance applies to city developments, too. To build Appaloosa Library, on Scottsdale Road just south of E. Pinnacle Peak Road, the City of Scottsdale salvaged and replanted 30 desert trees, including 16 Blue Palo Verdes. The purpose of the ordinance is to save slow growing, hard-to-replace plants found only in the Sonoran Desert. Scottsdale has issued over 8,000 native plant permits and salvaged an estimated 350,000 protected plants. Water Conservation Ordinance: Scottsdale first adopted the ordinance in early 1990s. It encourages developers to use low-water technology, appliances, fixtures, water features and landscaping. For example, it limits the size and type of outdoor water features, requiring equipment that minimizes leaks and overspray, such as re-circulating pumps and wind shut-off valves. The ordinance also offers businesses and residents rebates on their water bills in exchange for saving water, such as installing water efficient toilets, removing turf, and upgrading irrigation controllers. The ordinance limits the amount of grass used in landscape designs, including for schools and churches, commercial buildings, and common spaces in HOAs. The cities have led in smart development strategies, but their work is never over. While some environmentalists say cities are not doing enough, some developers continue to work against the cities’ efforts to conserve. Here’s a recent example: During the last session of the Arizona Legislature a bill (HB2570) was introduced that would strip cities of their power to require developers to save some native trees and plants and to require drought tolerant landscaping. While this is hard to imagine, particularly after 15 years of drought, the bill initially met with little resistance and is expected to reappear next year. As the drought continues, wise water use in our desert environment becomes even more critical. All of us must do our part, including the development community. Stripping cities of important water management tools is counter-productive and just plain wrong.